Jeff Rosen of East Meadow, NY said “the lines for the tee-shirts were six furlongs long.” NYRA should go into the apparel business, if the deal for the Aqueduct casino doesn’t happen. An editorial in The Saratogian warned readers on Sunday that the politicians are still fumbling around with the details. “What are details but the bad ends of dissembled dreams,” wrote a correspondent in Time Magazine. The gray tee-shirts, which were free with each paid admission, had long sleeves and two-color imprints on the front and back. Several sizes ran out in an hour. 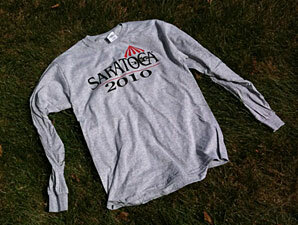 The word “Saratoga” and the date “2010” across the front made them priceless. Of course, they are selling already for $10 on Ebay. “I’ll sell you one for $20,” said Anthony Brackett-Levo of Saratoga Springs, NY as he exited the racecourse early. “Neighbors pay me to come here and buy the shirts for them. They don’t want to wait in line,” Brackett-Levo said, which explained why he purchased 17. Meanwhile, at the races, the co-featured Gr.1 $100,000 Saranac Stakes went to Lethal Combination, the stone cold closer. Devon Rock and Fantastico Roberto obliged with a hot pace. When the field turned for home, jockey Alan Garcia swung the gelded son of Broken Vow wide for trainer Kiaran McLaughlin and the three found their way into a Adam Coglianese photograph. The early fractions were 23.22, 46.49 and 1:10.79 – too fast for nearly 10 furlongs. Four of the eight two-year-old fillies in the 7-furlong Gr.1 $250,000 Spinaway Stakes were saddled by Todd Pletcher. Such riches explain in large part why he and not Linda Rice or Chad Brown will win the trainer’s title. R Heat Lightning lagged behind in the early stages, then circled the field and drove steadily to the front with robust urging from Garrett Gomez. Valiant Passion finished third but ran well enough to make her new owners, Team Valor, glad they bought her. The last polo match of the season took place at Whitney Field. Two separate diversions occurred for the crowd. One was watching John Walsh of America’s Most Wanted and his young son on horseback for team Shamrock. The other was seeing a bride stomp the divots with cowboy boots while wearing her wedding dress. The new Mrs. Jeff Yusko, Jackie Bernstein, wore an off white, strapless ball gown that featured a bow on the back and side pockets. The happy couple danced the reception’s first dance midway into the fifth chukker. 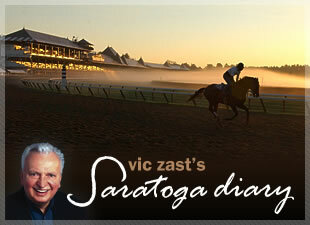 Vic Zast has attended at least one day of Saratoga horse racing in each of the past 47 years. He writes a Monday morning column for HorseRaceInsider.com.